100% reliability , 100% satisfaction ! Maptun offers a simple upgrade for those who want the opportunity to fill up with E85. The car will receive a 100% BioPower function which means that gasoline and E85 can be mixed in the tank in any proportion. Conversion is with MapTuner. correct Spark plugs are included. MapTuner is a product developed completely in-house at MapTun Performance AB. 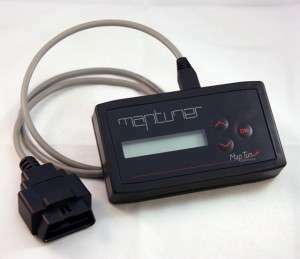 The MapTuner is a small hand-held device that you connect to the OBD2 diagnostics outlet and reprogram the car yourself with a few simple keystrokes. You can revert to the original programming at any time. The MapTuner has a number of bonus features, all included as standard. The speed restrictor can be set to anything between 50 and 300 kph in 10 kph increments. A shift up lamp will appear whenever it is more economical to use a higher gear. It will also appear if you are approaching the rev limiter. If your Check Engine light is lit, the MapTuner is able to read the fault code and erase it with a few key strokes. Different wheels have different circumference. With the MapTuner you can easily calibrate the car so that the speedometer is accurate. When you buy a MapTuner, your email address will be registered with the MapTun Performance server. Whenever there’s a new version of your software you will receive an email telling you to synchronise the MapTuner with the server. This way your car will always have the latest version of the software! At an additional cost, you can upgrade your software to a higher tuning stage. The software is easily downloaded to the MapTuner via the online service. Up to four different software’s can be contained in the MapTuner. This is a good option if you are lending the car to a friend, having it serviced or inspected. It makes it possible to “de-tune” the car without actually removing any hardware.